You are currently browsing the category archive for the ‘Colombia’ category. There has been massive support among local communities in Colombia for striking workers who have previously backed them in confronting the Cerrejon coal mining expansions. The workers have rejected the company’s plan to divert the River Rancheria. Meanwhile, an armed attack on mine property has been condemned by both major mining unions, SINTRACARBON and FUNTRAENERGETICA. To show support for the workers, see http://londonminingnetwork.org/2013/02/take-action-to-support-mine-workers-hungry-villagers-in-colombia/. The BHP AGM is on again this Thursday. If you’re in Sydney, come down to Darling Harbour and let the shareholders know how destructive their company really is. We’ve prepared an alternative annual report detailing BHP’s dirty deeds, and we’ll be making more noise than an open cast mine. The folk at Carnival of Dirt have put together this awesome poster of BHP Billitons atrocities in Congo, Chile, Colombia, Australia and Papua New Guinea! Check it out. Check out the Carnival of Dirt website! Today at the annual general meeting for the largest mining company in the world, BHP Billiton, aboriginal elders and civil society representatives have attended to share their concerns. Dave Sweeney – Australian Conservation Foundation, Donna Jackson – Larrakia nation, Mitch – Arrente and many others – including Christian Miller from Chile. Uncle Kevin Buzzacott addressed supporters gathered saying, calling on the people of Melbourne to regularly visit BHP headquarters to keep them accountable. Uncle Kevin Buzzacott is from Arabunna country, directly impacted by BHP Billiton’s uranium mining operations has brought a ‘Notice of Trespass’ to be served on BHP. 40 supporters gathered to support over 20 delegates who entered the conference to share concerns about many aspects of BHP Operations across Australia, and worldwide. Conference delegates were greeted by a massive 6 metre high inflatable nuclear waste barrel and were handed copies of a different style of report. A collective of environment groups from across the country have today released BHP Billiton: Dirty Energy ‘Alternative Annual Report’. Arabunna elder Uncle Kevin Buzzacott was one of a number of traditional custodians who travelled to Melbourne to challenge the board of the world’s biggest mining company, BHP Billiton, over the despoiling of their country. Here he describes his reception at the AGM. We hear first from Friends of the Earth anti-nuclear campaigner Tully McIntyre, who witnessed proceedings, and Japanese for Peace campaigner Tomohiro Matsuoka. BHP Billiton was part of a consortium of three multinational companies which in late 2000 bought the Colombian Government’s 50% share of the massive opencast Cerrejon coal mine in the Department (province) of La Guajira in northern Colombia, one of the largest opencast coal mines in the world. 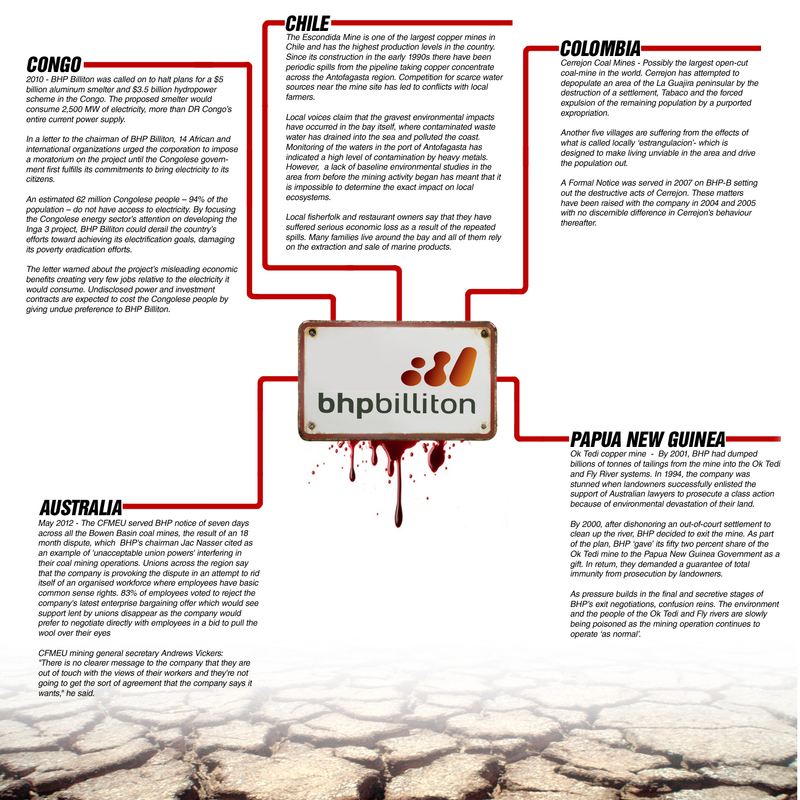 An Alternative Annual Report on BHP Billiton with case studies from across the world Case studies questioning BHP Billiton’s record on human rights, transparency and ecological justice.